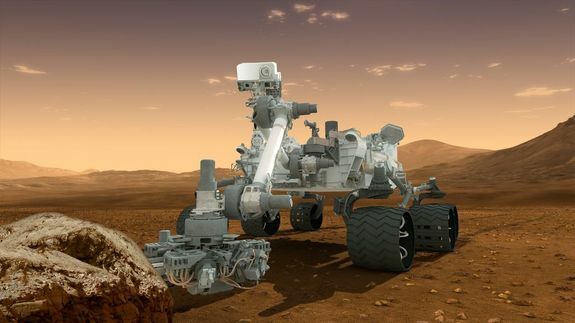 NASA’s Mars rover “Curiosity” is set to land on Mars August 6th, and when it does it’s going to double as a weather station. In addition to looking for signs of current and past habitability to extraterrestrial life, the rover, due to land Aug. 6, will learn more about whether Mars could be habitable for humans — particularly in terms of its weather. The continuous record of Martian weather and radiation Curiosity plans to collect will help future forecasters tell humans — should we choose to go — how best to protect themselves in the harsh environment, experts say. Weather forecasting will also be needed for astronauts roaming on Mars. In a first since the Viking vanguard missions of the 1970s, MSL will feature a full meteorology package called the Rover Environmental Monitoring Station. The Spanish–built REMS will run for at least five minutes every hour, night and day. First of all, I hope the readings will be available to the public. Even with it’s thin atmosphere it would be amazing to see current readings from Mars. Mars’ weather is so fascinatingly different from Earth. The temperature can go from 20 C (68 F) to -90 C (-130) at night, with lower values during the winter. There are some small clouds of ice or carbon dioxide (dry ice )that can produce light snow, and the planet’s famous dust storms can cover the whole planet for weeks. In addition to my life-long love for weather, I’ve always been enthralled with astronomy and space travel. With a week left til touchdown, I say good luck to NASA and Curiosity. ← Know about the NWS Storm Prediction Center?